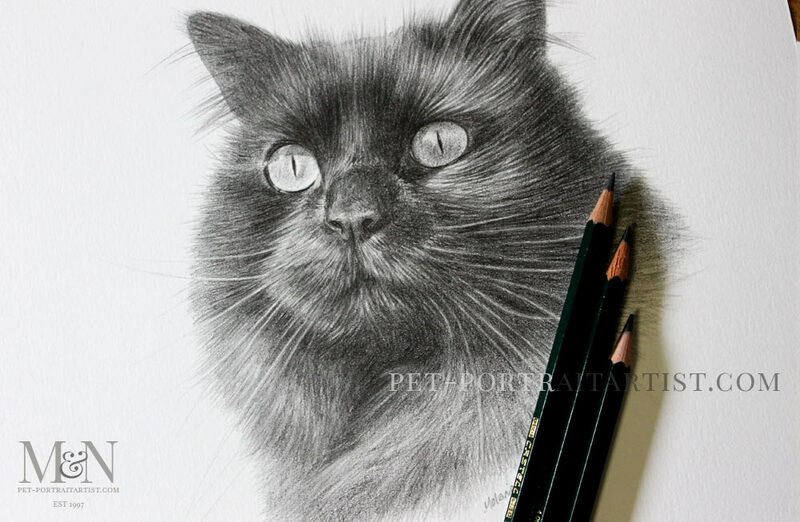 Welcome to my latest Cat Pencil Portrait of Penny. 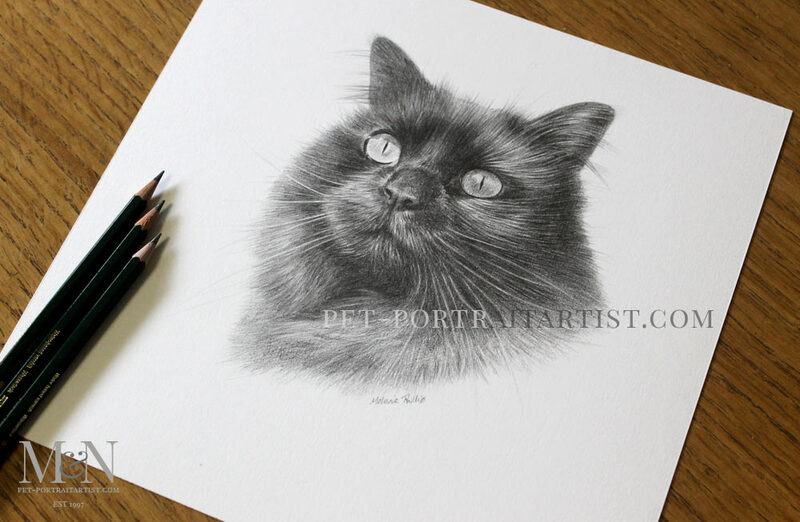 Jeanette telephoned our studio to ask if i would be able to draw their beautiful black cat called Penny. Jenette wanted it to be a gift from her family to her on a special 50th birthday. 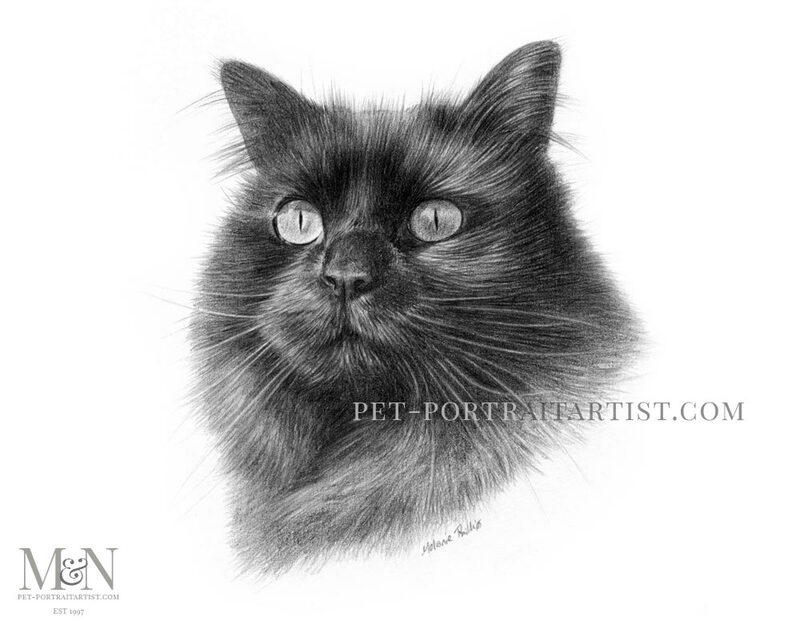 I have researched many pet portrait artists, and believe you and your husband’s work are undoubtedly the best. How wonderful! We were absolutely delighted to read this and we love hearing how our clients find us and why they choose us. Jeanette emailed some lovely photos of Penny, although none were really suitable for a portrait. Jeanette waited for a sunny day and took lots more of Penny and came up with the perfect photo! Clients are so patient when it comes to taking photos fo their pets for us. We are very thankful of that. 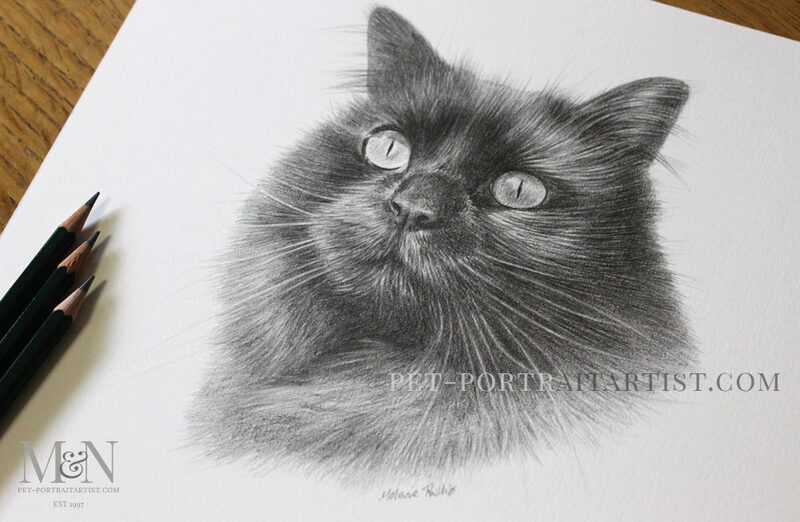 The portrait of Penny was drawn at 10″ x 8″ size. We chatted on the phone and via email about the portrait and the various elements that needed to be included and you can see the final results below. I thoroughly enjoyed drawing Penny and I have taken some photos of the portrait with my pencils to show scale. The portrait was framed by Jeannette’s local framer and its beautiful! 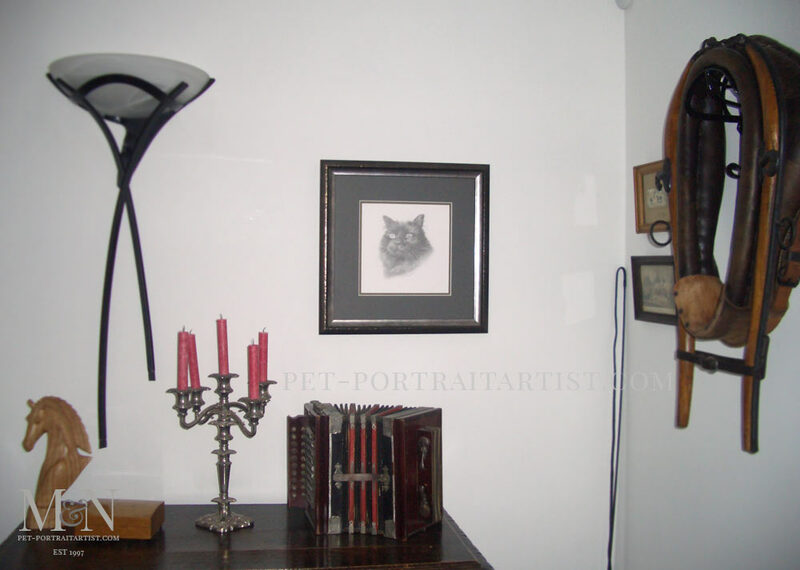 Jeanette sent two lovely photos of the portrait all framed and displayed on the wall. We love the combination of the olive green and charcoal coloured mounts. 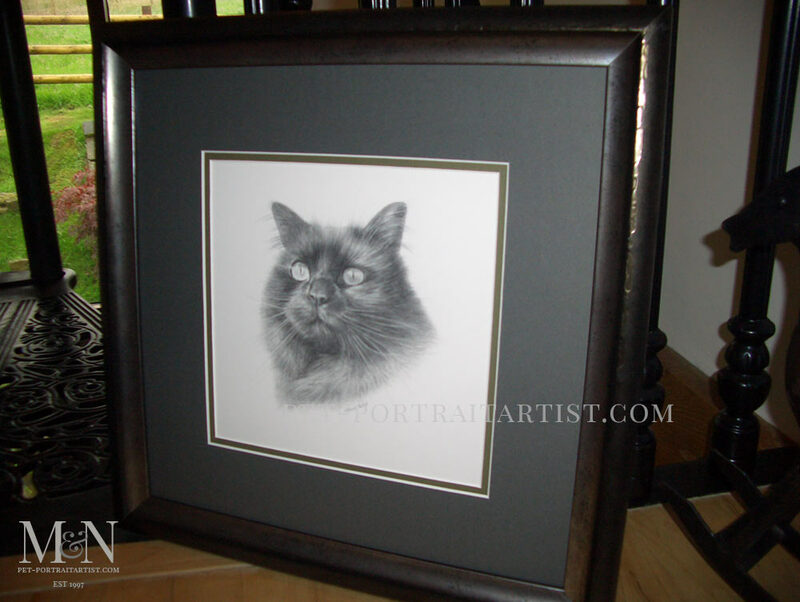 It all works beautifully with the frame – and with the portrait of Penny! Thank you so much Jeanette for sending them. I will be adding them to my website very soon! I have had Penny framed, chosing an antique pewter frame to fit in with the décor and framed with a double mount as you recommended. We introduced a coloured mount (olive green) to compliment her eyes, as suggested by our framer. We think it really offsets your drawing and hope you like it too. Here are a few photos taken before the portrait was shipped to Penny’s owners. The pencils are to show scale.